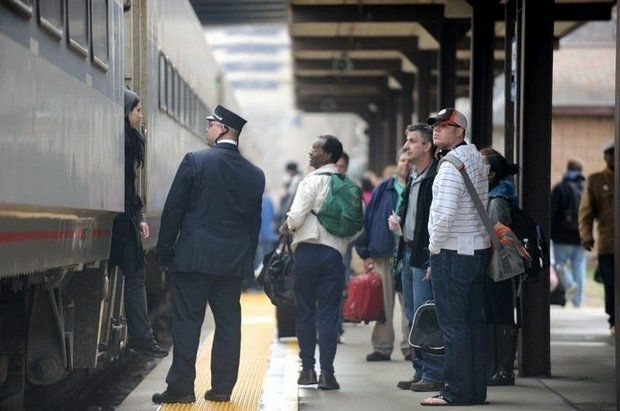 Talks of a new Michigan coast-to-coast passenger rail line are picking up. The Ann Arbor Area Transportation Authority’s governing board voted Thursday night to authorize entering into a $100,000 contract with Transportation Economics and Management Systems for a rail ridership and cost estimate study for potential passenger rail service along the Detroit-Lansing-Grand Rapids corridor. The study will seek to determine the demand and feasibility for new intercity passenger rail between Michigan’s east and west coasts, intersecting major population centers including Detroit, Lansing, Grand Rapids and Holland. The study will involve looking at the economic and financial impacts of establishing such a service, which may or may not include a stop in Ann Arbor. The AAATA is acting as a conduit for pass-through grant funding on behalf of the Michigan Environmental Council, which is taking the lead on the study. Benham said a number of alternative routing options will be considered, some of which might go directly from Detroit to Lansing to Grand Rapids and some of which might be routed through Ann Arbor, which he acknowledged could prove difficult given the lack of a connection between the east-west tracks and north-south tracks. There also have been talks lately of establishing passenger rail service between Ann Arbor and Traverse City, with stops in Cadillac, Mount Pleasant, Alma, Owosso and Howell. That would be a continuation of the north-south WALLY commuter rail line between Ann Arbor and Howell, which the AAATA is studying. The history on the Detroit-to-Grand Rapids project goes back to 2010 and 2011 when the Michigan by Rail team, made up of the MEC and the Michigan Association of Railroad Passengers, collected public input for Michigan’s State Rail Plan. The feedback called for the re-establishment of rail service between Michigan’s east and west coasts. In the 2011 Michigan State Rail Plan, an alternatives analysis and environmental review were recommended for the Detroit-Lansing-Grand Rapids corridor. In 2013, the MEC and the Michigan Department of Transportation’s Office of Rail determined that a study for intercity passenger rail service between Detroit and Holland should be conducted. The AAATA was granted $100,000 to support the study through an MDOT grant program. The AAATA will be the fiduciary for federal funds passed through MDOT, and the MEC will be the fiduciary for matching local funds from various organizations across the state, according to the resolution approved by the AAATA board. To move forward on the study, the AAATA issued a request for proposals in November on behalf of the MEC. Three proposals from firms looking to take on the study were received and reviewed by an evaluation team that included representatives from the MEC, MDOT’s Office of Passenger Rail and the AAATA. The proposal from TEMS was determined to be the most advantageous. MDOT must approve the selection before a contract can be signed. Benham said it’s unlikely the Detroit-Lansing-Grand Rapids corridor project would involving laying any new train tracks. “All the routes that are being looked at are intended to be routes that already have tracks between the two points,” he said. He said they’re talking about passenger rail service “really in the same family as Amtrak service,” not commuter rail service. AAATA board chairman Charles Griffith said he sees the passenger rail service between Detroit and Grand Rapids as another piece of a larger puzzle. “A lot of these things are still in the study phase, so in some ways it doesn’t feel like we’re any closer to actually having rail as an option,” he said. MDOT is considering plans to sublease rail cars or cut its losses after spending millions preparing for the local commuter rail lines that have yet to materialize between Ann Arbor and Detroit and Ann Arbor and Howell. As of May 2014, MDOT had spent $9.5 million to lease and refurbish seven cab and 16 coach cars and is still on the hook for another $2.7 million, according to a state audit that concluded MDOT did not effectively oversee the lease. Planned restroom upgrades for some of the cars could cost another $3.7 million. Benham defended those expenses Thursday night. “We talk about public involvement. The railcars really give us an opportunity to involve the public in a hands-on way,” he said. The AAATA recently kicked off an 18-month feasibility study for the proposed WALLY commuter rail line using a $650,000 federal grant. Consulting firm SmithGroup JJR has been hired to facilitate the study. The first advisory committee meeting is next Wednesday in Northfield Township.